Bama Ranganathan documents the life of the Ramakrishnan family. 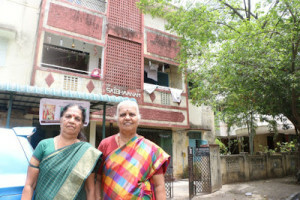 Kalyani and her sister in front of their apartment which was built on the site of the original independent house in CIT Colony. Coconut groves, fruit and flower trees in abundance and gardens filled with vegetables – this is not in a village in interior Tamil Nadu. This was C.I.T. Colony to be specific, in the 1950s. (City Improvement Trust – CIT – one of the state’s initiatives to promote housing in various parts of the Madras city). “Our family was one of the first to occupy this area, in the mid 1950s,” says Kalyani Muralidharan, who runs classes for children in the same house her father built in 1954″. “We used to live in Adanja Mudali Street, near Mandaveli market. It was a small house with a small portion, what we call ondi kudithanam. My father was an electrical and building contractor. The government started this project – City Improvement Trust – to make plots available to interested people. My dad believed in investing in land and so he bought a two-ground plot for Rs. 3,000”, she recalls. Being in the construction industry, he chose the best to construct the house. “The foundation for the house was laid at 8 feet below the ground. He built the ground floor first, then added on floors to give separate flats to each of his 5 children”, says Kalyani’s sister Radha Srinivasan, who lives in one of these flats. “Our father was perhaps the first in the area to come up with the concept of a family flat,” she adds. G. Ramakrishnan and his wife P.R. Meenambal (Kalyani and her siblings’ father and mother) moved in to their house in mid-1954. The house is behind the Ramakrishna Mutt and Vivekananda College grounds. But when they moved in to this colony, the place was much of coconut groves and fruit trees. “It was like a forest. All kinds of trees grew here – coconut, magizham poo (Spanish cherry or bullet wood), Flame-of-the-Forest. There were no houses here. From here, we could cut across this land, then pass by Nageswara Rao Park area (which would be a lonely space) and reach Sai Baba Temple (which was then newly founded) in just a few minutes. We didn’t have to worry about traffic either,” recalls Radha Srinivasan. There are other fond memories the sisters have – of growing up here. “We used to play outside all the time. We were 5 siblings, and there were our neighbour’s kids. So the street would always ring with our laughter and noise,” they say. “Till the mid-sixties, there were not many houses here. Then, slowly the whole area started developing,” says Kalyani. This family’s children went to Ramakrishna Mission School till Class 5. The girls then attended St. Ebba’s Girls’ School since the education was free there. They, then went on to SIET College. “We walked everywhere. No buses or autos for us,” they say. “We were also brought up with a strict code. Our father used to garden and we had a number of plants. Amma would wake us up at 4 a.m. to collect the vegetables and flowers from the garden. Avarakkai (broad beans) and kothavaraikkai (cluster beans), pudalangai (snake gourd), vazhaikkai (plaintain) – all grew around our house and featured regularly in our menu. “We had many kanakambaram (firecracker flower) plants and we would pluck the flowers to weave into garlands for our hair,” says Radha. “After coming back from school, and having our tiffin, we would go to Sai Baba Temple. Then play from 4 to 6 p.m. At six, we would be called inside, to wash up and say our prayers. We would study from 6 to 8. At 8, we had to shut our books, have our dinner, spend some time with family and then go to bed by 9,” they say. Pandi (hopscotch variation) and kallangaa (five stones) were some of the games played by the children then in the open spaces in CIT Colony. Sometimes, friends would accompany them back from school and that would add to the number of children playing in the street. “It was much cooler, there would be a pleasant breeze from the trees. We slept on mats in the veranda, did not use even a fan”, they recall. But they do have scary memories of a lonely colony. “We think we saw the ghost of an old woman in the early mornings while drawing kolam outside. We would run screaming inside and later discuss this sighting with our friends at school,” says Radha. “We would find clay pots littered in the grove and used to think that ghosts left them behind,” chuckles Kalyani. Mangoes, guava and nagapazham (jamun) grew in abundance in the area. “We loved to gather the small nagapazham in our skirts. How many skirts had been dirtied by those fruits!”, they recall. As the colony grew, Rathnaiah, a resident, started a KG school in the colony. By then, huts had started coming up in Kattu Koil area (a scrub jungle area where Our Lady of Light church built in the 16th Century is still located – towards Luz area). “It (the KG school) was called Aunty’s School and was attended by all the children in the colony, especially the children of the milk men, servant maids and workers who lived in the huts. The fee was very nominal, about Rs. 3 or so and the education was very good,” says Kalyani. A social club for women was also came up around the same time. It was a small, one-room building where the women gathered in the evenings to chat and play indoor games. “I remember Amma playing throwball and tennikoit there,” says Radha. The women developed deeper bonds and were more like family than friends, they recall. “During Deepavali time, or if there was any wedding in a family, all the women would gather to make murukku. After seeing their children and men off, they would gather at around 10 a.m. to spend the day making bakshanam (sweets and snacks) or murukku. “Murukku sutharadhu (twisting the murukku) was a special skill and they really enjoyed these occasions,” says Kalyani. “The women would also gather each morning during the month of Margazhi (mid Dec. – mid Jan) singing songs and visiting nearby Perumal temples. Everything was a community affair,” says Kalyani. A few Christian families were also settling down along Bishop Wallers Avenue and these families became friends of the Colony’s first residents. “They would attend all our family functions – even Navrathri golu. And we would visit them for theirs. This continues even today,” they remark. As the colony started expanding, more amenities came up, but the spirit of a close-knit community seems to have faded away. “Though we may know the early settlers, we no longer know all our neighbours; children nowadays do not get to enjoy the same carefree life that we did. Those were the good old days,” says Kalyani – (Courtesy: Mylapore Times).